Zuidas houdt je op de hoogte - Zuidasdok is happening – make sure you stay informed! Home > Agenda > Zuidasdok is happening – make sure you stay informed! March Zuidasdok is happening – make sure you stay informed! To provide you with more information about the work that will take place in April, May and June and how it will affect you, we are organising two information meetings on 26 March at the WTC Zuidas Business & Conference Center (Strawinskylaan 77): in the afternoon from 16.00 to 18.00 and in the evening from 19.00 to 21.00. At the end of this message, you will find information on how to sign up for one of the two meetings. Although we’ve been hard at work preparing for the construction of Zuidasdok for quite some time, you’ve probably not yet noticed much difference. That’s now really set to change. We’re building two new passageways under the A10 and the railway. On Arnold Schönberglaan, an enormous roof is now in the process of construction. It will form the first section of the Brittenpassage, which will extend Benjamin Brittenstraat. In order to put the roof into position, we need to carry out work on the A10 and under the railway in May and June. Some distance away, we’re also working on the Vivalditunnel. This cyclists’ and pedestrians’ tunnel (which also serves as a tunnel for wildlife) will connect Antonio Vivaldistraat (on the southern side of the A10) with Beatrixpark (on the northern side). The construction of both of these passageways will involve installing numerous foundation piles that will support the roof of the future passageways. The southern lane of the A4 and A10 Zuid will be closed from Badhoevedorp for four weekends in May and June. The closures in May start on Friday evenings at 22:00 and last until Monday morning at 05:00. The fifth weekend is Whit weekend. The road will also be closed on Whit Monday and only limited train transport will be possible. Read more about these weekends and the diversions here. As you can see below, there will also be inconvenience on other weekends. This includes the weekend of 6 and 7 April 2019, when metro services will be limited and Parnassusweg will be closed in the direction of the city. As you probably know, the tram between Amstelveen and Amsterdam Zuid station was taken out of service by the GVB on 3 March 2019. 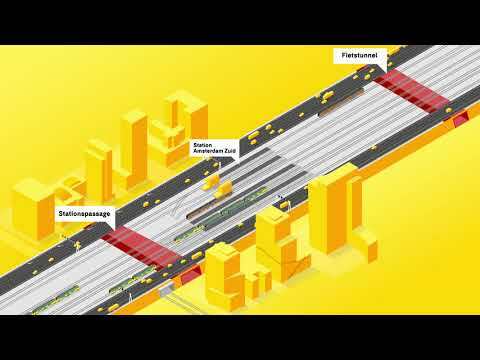 This will enable the construction consortium ZuidPlus to demolish the railway and tram tunnel running under the train and metro tracks and the A10, from Parnassusweg to the metro platform. This demolition work is necessary to make way for the Brittenpassage, which will be the future second entrance to Amsterdam Zuid station. The overhead lines and rails have already been removed from the tunnel. The demolition work will take place in the weekend of 6 and 7 April. It will cause some noise nuisance and dust. Read more about it in the letter to residents below. For more details, read the letter to residents in and around Zuidas below. Every Tuesday afternoon from 15:00 until 17:00, ZuidPlus holds a consultation session in the Amsterdam Zuidas information centre, where you can come with any questions or comments about the building work. Of course, you’re always welcome to visit us in our information centre and can contact us by telephone or by e-mail. Sign up below for one of the two meetings on 26 March.